The Communications Division at Orange County Government is the recipient of Ragan PR Daily’s Digital Award for Best Community Engagement, recognizing the groundbreaking success of online outreach efforts with citizens during Mayor Teresa Jacobs’ 2014 State of the County address held in June at the Ballroom at Church Street. Ten Social Media Ambassadors – who have large followings on social media networks such as Twitter, Facebook and Instagram – were invited to assist in increasing public engagement and awareness of Orange County’s signature event the State of the County, presented annually by Mayor Jacobs. The goal of the campaign was to increase citizen engagement and facilitate a dialogue with a broader demographic by utilizing online influencers from the region’s burgeoning social media, blogging and technology sectors. In the days leading up to the State of the County, the Ambassadors received messaging and digital images to support a grassroots hashtag campaign using #YearofTransformation, #SOC2014, and #OCTransformation. Google Glass was used to record and share live from the Ballroom, making the event the first State of the County address in Florida to feature the technology. The Social Media Ambassadors initiative proved to be one of the most successful digital outreach initiatives in Orange County’s history. From June 2 through 6, the campaign achieved nearly one million (956,387) total online impressions on Mayor Teresa Jacobs’ and Orange County’s official Twitter and Facebook pages. Two event specific hashtags, #YearofTransformation and #SOC2014, achieved local trending status during the 2014 State of the County on June 6. Winners were selected by a panel of judges and were determined by how the campaign engaged online community leaders and opinion makers transforming them into advocates for the brand. “Orange County Government wins top honors … for its ingenious use of local online talent to help reach and engage hundreds of thousands of county residents,” PR Daily stated in its official announcement made on Thursday morning. 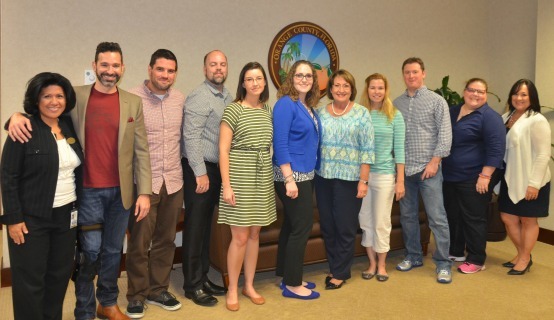 The Social Media Ambassadors will continue their role as innovators and collaborators in the County’s new Technology and Social Media Workgroup, which will operate as a think-tank to advance new technologies, social media and mobile applications supported and developed by Orange County Government. The workgroup will also collaborate on how to best enhance online public engagement and support the growing technology and digital community in our region. Social Media Ambassador Bess Auer, founder and organizer of FLBlogCon and a fourth generation resident of Winter Park, agreed. Winners of PR Daily’s 2014 Digital Awards include the United States Olympic Committee, global PR solutions provider Cision and health care provider Kaiser Permanente. Last year’s winners include MTV, the Coca-Cola Company and the Four Seasons Hotels and Resorts.